Interestingly, Consumer Reports published an assumption that the Tesla Model 3 will likely earn average reliability, not to mention the fact that the reviewer has Tesla reliability all over the map. The reason CR’s Model 3 statement is an assumption is that the publication has yet to drive the car. In fact, they don’t even have their hands on a Model 3 yet and probably won’t for some time. However, someone at the outlet felt it appropriate to say that the Model 3 will “probably” not be more than average in regards to reliability. Keep in mind that CR predicting reliability for new vehicles is not a new concept. The magazine commonly does just that. Generally, estimates are based on the automaker’s current reputation for reliability, comparable models, shared components, etc. It’s a bit difficult when dealing with Tesla and its lack of traditional model years, regular hardware changes, and continuous over-the-air updates. At any given time, two very similar Tesla vehicles could actually be quite different, depending on exactly when the cars came off the assembly line, and what updates have pushed through. Too bad it might be years before they can get one. Heck, Elon’s mom can’t even get a Model 3, and we have to assume that if CR is on the list, it’s going to be a long time coming. 63 Comments on "Consumer Reports: Tesla Reliability All Over The Map"
Omg something other then positive about Tesla it must be wrong!!!! InsideEVs needs to chill for a second. With 640,000 reader vehicles surveyed it’s a wide pool of information. Tesla has a large, expanding workforce and suffers from quality issues that are norm with a new staff. CR also includes the cost of fixing in its prediction which for Tesla is sky high. CR dose not need to drive the car because it is a prediction and only needs the information available at the time. it’s an utterly pointless prediction that serves to help nobody. It actually causes more harm than good because a lot of idiots take the prediction as if it’s some kind of fact rather than with a pinch of salt. I agree except for Tesla repair cost. Tesla repair cost are cheaper than comparable vehicles. Yes, a Model X is more expensive to repair than a Chevy Trax, as are all ultra premium CUVs. How many cars do you think Tesla has actually sold? You think it is anywhere near 640,000? How many surveys CR has done of F150 owners, or Toyota Corolla owners is meaningless. Then they should rename their rag Consumer Speculation, because that’s not a report. And I doubt people paying for a CR subscription appreciate pages being wasted on speculation, either. I predict that your prediction is predictably poor. Look for a review in 2021….maybe 2020 if they’re lucky. Tesla reliability…there’s an oxymoron for ya! Finally. I love Tesla and the S is the best car I have ever driven. But they are regularly revisiting the dealer more than most. Who’s they? You are definitely not talking from own experience. I was mildly surprised when Consumers Reports predicted an average reliability rating for the Model 3. I was shocked to see Tesla complaining! Did they think they got too high a rating? No, Tesla thought it was too low! Tesla, almost every manufacturer thinks CR is too tough when guessing their cars future reliability. They’re usually right, though, and sometimes too optimistic. Tesla does seem to resent any review (or preview, or estimate) that indicates their products aren’t the best thing since sliced bread in every possible way. The Model S has the best driving score possible, above average reliability, and the best overall rating in its class, but instead of patting themselves on the back for that like most automakers would, Tesla is focusing on Model 3 projected reliability being “just average.” Sometimes Tesla’s PR folks seem a bit thin-skinned to me. I’m sure the first batch of Model 3s will be well below average with quality steadily improving as Tesla gets grip on the production process. Exactly. Which is why Tesla should have taken that average predicted reliability rating and run with it. But instead they drove it straight into the ground, in typical Tesla fashion. Yet another reason why CR shouldn’t make a rating until they have sufficient data. A rating based upon a few hundred pre-rampup cars would be completely non-representative of the reliability of hundreds of thousands of units built after ramp-up. That would just be bad science. Wait, are we talking about Elon or Donald Trump here? Bada Bing! Thanks folks, I’ll be here all week! That’s not a prediction I think will come true, at least I hope not. I’m in my 3rd year for a Tesla Model S being my primary daily driver and it’s thus far been the most reliable low-maintenance car I’ve ever had. Only repair item I ran into is one of the door handles stopped auto-presenting; Tesla quickly fixed it next day. The weekly gas station maintenance visits to fill up my old gasser are not missed. Yes, it’s pretty much true that no goes back to ice once they have tasted the deliciousness of the Tesla. Maybe CR could do a survey on that. So what’d you do? Climb through the windows? Or the hatch? I’m sure that was a fun 24 hours. It was the rear passenger door handle… the other three door handles operated as normal so didn’t need do a dive through the window or hatch. All you have to do is use the button on the fob if the door handle doesn’t auto-present. For Model S the fob will unluck the car and present the door handle but fob does not “open” the door (unlike Model X where fob can also open the door) … so for Model S need a presented door handle to open the door. Thanks for the clarification. I didn’t know they were different. So what is the issue here between Tesla and CR ? If I understood it well, Model S reliability is good, Model X’s is not so good and CR says that basically it is likely Model 3 reliability will be average according to Tesla reliability history. Are other car makers also whining like this ? Why can’t this car maker & its leader shut up a little bit, that would make us holidays. Consumer Reports is making predictions with no data. Leads to quwstion how many other models they rated with little to no data. Consumer Reports handed Tesla a gift by predicting the Model 3 would have average reliability. Tesla should have simply said that they expect the Model 3 will exceed this prediction, rather than get all Trumpian about it. The FUD is actually a consequence of Tesla’s failure to ship product, with NDA clouds of secrecy surrounding it. Change that, Tesla, and you’ll get better press. Until then, I guess you have something to hide. My theory is Sean Spicer got a gig in Tesla’s PR department. We haven’t heard much from him other than that one awards show appearance. The fact of his employment there would probably be shrouded in 8 levels of NDAs, so it’s plausible. Tesla reliability isn’t all over the map. The map includes an entire area of above-average reliability which Tesla has no claim to. CR usually would predict below average reliability for a new model, that’s the common case for most makes. New models just are less reliable until the bugs are out. They predicted average reliability for the Model 3, which would make it tied for the most reliable car Tesla ever made. And somehow this wasn’t good enough for Tesla. What a bunch of babies. You didn’t read the story, or the links, did you? CR currently rates the Model S as “above-average” in reliability. I didn’t read all the links. The story doesn’t say CR rates the S above average. It says they saw some above average data. I’d provide a link to the Model X page, but looking at those numbers is borderline NC-17. Double the Model S’s “average repair trips per 100 cars” figure and you pretty much have the Model X number. But hey, don’t bother correcting your post when you learn new information…. Ask me again if you need further explanation as to what that means. So I already did what I could on corrections. You do realize there’s no edit function, right? At some point you lose credibility when you jump from one end of the scale to the other in the course of less than a year. When you have a company (Tesla) that ships cars without a promised feature (AEB), then busts their own deadline for adding that feature, then finally does add it OTA, then takes it away with another OTA, then adds said feature back weeks later, the yo-yo ratings are completely understandable. No, a single feature absolutely does not justify that yo-yo. No, you lose credibility when you rate something because of politics or favoritism instead of your growing pile of statistics. CR changing their ratings as they get more data is a good thing. The only thing that explains this sort of volatility is CR making their rating decisions based upon politics instead of statistics. Do you really believe that customer surveys are what yo-yo’ed? from average to below average, to average, to above average? Because not even CR claims that. CR gets only a small amount of data. They take data from their subscribers. Any car which is sold in relatively small numbers gets very poor coverage for data. Model S/X (and Roadster of course) are good examples of this. Also the data is skewed because some types of customers simply don’t have a good frame of reference or are enthralled with their car. If a person doesn’t pay any attention to cars and only gets a new one every 10 years are they really a good evaluator of cars? What if it is their very first new car? There are limitations to their data set. It doesn’t mean CR is malicious, they do the best they can but they can only do so well. You are unwittingly arguing that CR’s conclusions are all invalid, because the data set they are using is too small to support their conclusions. That certainly might be the case. Which brings up the question of what is their motivation to continue to print conclusions when they don’t have enough data to back their conclusions, if you are indeed correct. As I recall, from CR’s first report on the Model S based on customer surveys, they claimed to have a database of 600+ surveys. I don’t know what statisticians consider a statistically valid sample, but that seems to be fairly solid to me. No, the issue is not with CR’s sample size. The issue is with how CR arbitrarily assigns ratings to Tesla cars which are not actually based on their owner surveys. Nix already mentioned CR arbitrarily changing its rating based on a single Autopilot feature. I mean really, how ridiculous is that? Or should I say Ludicrious™ ? Another example of how CR’s actual ratings for Tesla cars don’t seem to match the data is their 2015 rating for the Tesla Model S P85D. 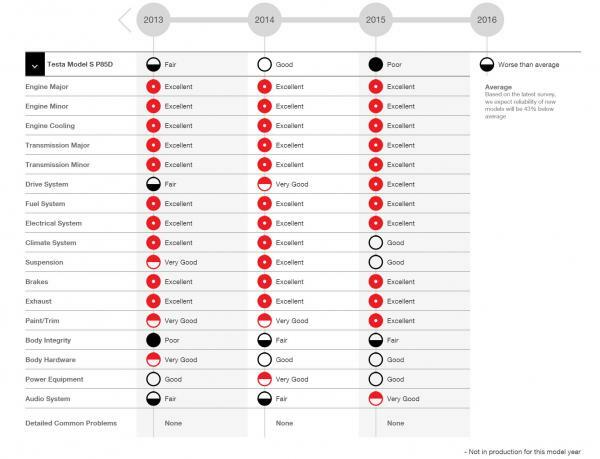 The chart they published (link below) had a breakdown showing the ratings for various systems, with 11 “Excellent” ratings, 1 “Very Good”, 4 “Good” and 1 “Fair”; and under “Detailed Common Problems” was “None”. Yet their overall rating was “Poor”! WTF is up with that? If that’s not an arbitrary rating which ignores the actual data, I don’t know what would be! This relatively new practice seems counter to everything Consumers Reports once traditionally stood for — reporting just the facts based upon hard data they have actually collected, and their own actual tests using cars bought anonymously instead of manufacturer supplied cars. This drift into editorializing and getting into projections without a single ounce of hard data without even setting a foot into a car is a move in the wrong direction for CR. If CR had given the Model 3 an “well above average” predicted reliability rating, Tesla and its fanatics would be pimping that rating like crazy. But it was only “average”, so CR is the enemy. Your strawman is so transparent it is silly. They shouldn’t have rated it at all until they had any data. Just like they used to do for decades before just recently. Do you seriously support CR dropping their decades long practice of actually basing their ratings on actual test results and actual data, and going to pulling ratings out of their backside? Again, that’s not true. I linked above to information showing how they have predicted reliability for a long time. They just didn’t do it before driving the car. But driving the car adds no significant data so that’s immaterial. CR has predicted reliability for a long time. You are quick to hammer me above for me errors, are you going to admit your own here? The error here is yours, in claiming that an auto reviewer can’t pick up anything relevant to the reliability of a car from a test drive. Auto reviewers often mention such things as how solidly the door “clunks” (or doesn’t) when you close it, and whether or not there are squeaks from the dash as the car drives over rough terrain, as indications of how well built the car is. That’s not definitive data, but it certainly is data that CR wouldn’t get just by looking at pictures of the car! unlucky, you need to go back and read your own source. Because it doesn’t say what you think it says. So their screw-up with the Prius in your mind justifies continuing the practice? That seems like faulty logic. So your justification for repeating the same mistake of making recommendations without any shred of data of testing to back it up, is that they want to have some rating, any rating at all to stick on cars when they come to market? Whether they are just made up and not based upon any any actual data or testing? Whether I approve or not is a separate issue. The thing is they have done this for a long time. This wasn’t something invented to screw Tesla. CR has been doing this for quite some time. It is a necessity to make predictions as you don’t have all the data you will have at the outset. If you want to say you don’t like it anyway, that’s fine. But just be sure it’s because you don’t approve of making judgements before all the data in instead of just being hurt over it not favoring Tesla. Personally, I thought it was wrong for them to make recommendations based upon predicted reliability. I don’t really mind predicting reliability. But I think that recommendations should hinge on at least a year of data. That’s how they did it for American cars, Toyota should be the same. I think it’s crazy CR saw no problem with offering this service to Toyota up until the moment at which they burned themselves. It was lack of foresight on CR’s part to not see what they were risking with their actions. It has NOT been typical for CR to rate vehicles before getting data. Not in 2007 when your source itself said it was not typical, and has not been typical for decades before. You need to go back and re-read your own link. It looks to me like Consumer Reports is throwing away its credibility in a manner I find flabbergasting. And it’s doing so in wholesale lots, using both hands! It totally makes sense why Tesla is openly pissed off. They do not pay for advertising. They rely entirely on free publicity. That free publicity had been glowingly positive until the Model X came along. Since the falcon door fiasco surfaced, the light has slowly dimmed on them. This Trumpian rant against CR reveals a level of desperation which makes one wonder about how well things are going there. I’m not sure what the logic is of comparing the reliability of the Model S, Tesla’s first ever full production car (that also happens to be the quickest high performance sedan in the world) to the Model 3 with no data. The Model 3 is much less complex, and hyper-performance cars typically have more problems than spirited cars. If they were using the Model 3 actual data to try and predict the Model Y reliability (built on the same platform with similar components) then they MIGHT have some bit of justification. This is just too much of a stretch. And it doesn’t matter whether their bet ends up being right or wrong. It is about whether they should even be putting down any bet at all based upon the lack of data. CR may have an established practice of predicting reliability, and there’s probably nothing wrong with that. But I for one can’t fathom why anyone would be interested in such predictions, especially if they aren’t accompanied by some evidence that CR’s earlier predictions are accurate (at least better than chance), and especially for a manufacturer with so few models and registered vehicles over such a short time as Tesla. Hard data is what readers should demand and CR would to my mind seem far more serious if they refrained from judging products with which they have zero experience. That said, I doubt Tesla’s record is great. It’s a young company, and if the reliability record is average that’s a pretty good result in my book. More important to many owners is how a car maker deals with issues that arise, and my impression is that Tesla has done a pretty good job in that regard. Some disgruntled owners, probably with good reason, is unfortunately par for the course. So now Consumer Reports is issuing ratings for products which it has not tested. And speaking of “all over the map”, that sounds like a description of CR’s rather contradictory articles about Tesla’s cars, alternately praising them as “so good it broke our rating system” and then turning around and saying “we don’t recommend the car because it’s not reliable enough”. Did I mention that my opinion of Consumer Reports has been dropping of late? Dropping a lot, actually. Not now, it has always done it for other models and brands. They do it based on the current company models/brand reputation and past performance. Granted, they do say that they will revise it once they have the real data. This has always been what CR does. Of course, any Tesla cheerleader would feel it is a negative coverage and have to jump on discrediting CR as a whole but feels like a champ to quote CR’s positive coverage when it fits their own opinion.